After Lebron James left the Miami Heat for the Cavaliers, Chris Bosh, one of the now past Big 3 members, was expected to go to the Houston Rockets, and join Dwight Howard and James Harden, in what would of became a monster team. Bosh was offered a 4 year, $88 million contract by the Rockets. Houston had traded Jeremy Lin to the Lakers on July 11 in order clear cap space for Bosh. Houston was waiting, like everyone else, for Bosh to sign with them. They had all the specs, and just had to make it official. Miami, on the other hand, knew that if Lebron left, Bosh would go to Houston. However, Miami didn’t expect Lebron to leave. They felt confident that they had him secured, and that the Big 3 would be together for at least this season. But when the Heat offered Chris Bosh a 5 year, $118 million in the midst of the media frenzy that took place after Lebron’s second decision, Bosh re-considered, and took the extra money. I feel like Bosh made the wrong decision, because going to Houston would make them a top three team in the Western Conference, and gave him a better chance at another ring. 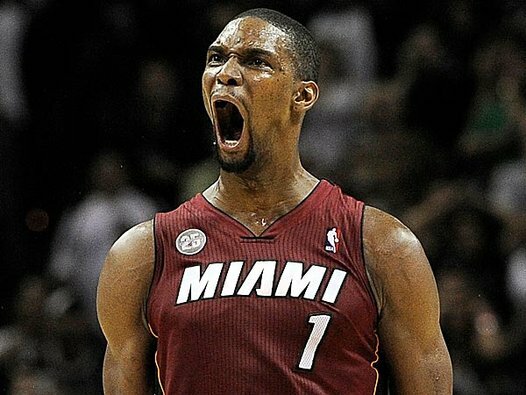 In Miami, it will be Bosh’s team now. He is in his prime, unlike Dwayne Wade, and will be playing with a manifesto of young, un-proven players, and good, but not great, starters who were payed for what they’ve accomplished in the past, or were the face of a franchise and were simply out-played by others. It’s called the Alex Smith Syndrome. The Heat have also added Luol Deng, a player who is supposed to fill Lebron’s void…. Not sure where that came from. Deng is a defensive guy who can also score, which is what the Heat are looking for. But replacing Lebron? Good luck. As mentioned up top, the Heat added Josh McRoberts and Danny Granger. I’m still shocked they got Granger at that price (2 yr/$4.2 million). McRoberts made a name for himself last year with the Hornets (Hey, I got it right! ), averaging 11.5 PPG and 6.5 REB in the playoffs. They also locked up Mario Chalmers and Chris Andersen (The Birdman!). Miami is re-tooling, and expect them to be good next year. In my opinion, the East has gotten better, not worse. I can’t believe it, I’ve heard people say the East has gotten worse so far through free agency, instead of it being wide open. Nope. My main example is Cleveland. That’s a non-playoff team last year, and now their going to be contending for the Eastern Conference this year. No, the Heat are probably not going to Finals, but they have good 2nd and 3rd tier guys along with Wade and Bosh who will make a impact. A touch on Wade’s contact, I really believe Miami is being nice to him since Lebron left. If Wade went to a different team, especially a contender, their is no way he makes more than $10 million. I was scrolling through my Twitter feed Friday morning, watching The Herd on ESPNU, when I saw the Sports Illustrated tweet, “The King is coming home”. At that moment, Colin Cowherd, broke the news, and read the tweet I just saw. The coincidence was incredible. I had told my Dad the night before, “As much as I want to be right with my Lebron prediction (I had him back to the Heat) “I want him to go back to Cleveland”. “It would be a great and emotional story”. The way Lebron left the Cavaliers in 2010 was wrong and heartbreaking for the City of Cleveland. He had been born 40 miles south of town and was the cities’s hero for eight years. He left for winning. He wanted a championship and he knew that was not possible in Cleveland at the time. He did, he won two in Miami with the Big 3. He went to the Finals four straight years with Miami. He had a experience that he never had with the Cavaliers. He won a championships. He had a choice to return to Miami with Wade and Bosh. His agent met with other teams. He had all the power. Lebron held every free agent to a standstill. The whole league waited on his decision. Free agents held off until he decided. And now, on July 11, 2014, Lebron is coming home. He will join Kyrie Irving, Andrew Wiggins, Dion Waiters, and a new, amazing coach in David Blatt. Kevin Love could be joining the squad, but lets not get to ahead. The story is incredible. Cleveland has alot to look foward to. In March, the sports scene was terrible. The Cavs had won 33 games. The Browns learned about Josh Gordon’s possible suspension. A city that hasn’t won a championship in 50 years, now has hope. Cleveland deserves this. Coming into the 2014 season, many people looked at the NL west as the best division in baseball. A division where last year, every team held the lead at a point in time. The Dodgers ended up winning the division after going on a 40-8 streak. Catching the league by storm, with the flash of Yasiel Puig, they were the favorites in 2014. As of July 6, 2014 the Dodgers are a half of a game ahead of the San Francisco Giants. The Giants, who led the NL West, and who were the reigning World Series Champions, fell apart, like everyone else except the Dodgers in the division in 2013. They signed Michael Morse, and locked up Ryan Vogelsong after the disappointing collapse. They added Tim Hudson, the 38 year old pitcher who had came off a broken ankle. Hudson, who as of June 6, has a 2.53 ERA with a record of 7-5, has blown all of the critics and writers who doubted the signing. The Giants sit in 2nd place in the NL West. Both teams have excellent pitching, with Clayton Kershaw and Tim Lincecum throwing no-hitters in the past month. Both teams can score quickly, with the hitting of Adrian Gonzalez, the powerful when healthy Carl Crawford, and the flash of Yasiel Puig for the Dodgers. With the Giants, the streaky Pablo Sandoval, the clutch Hunter Pence, and the star power of Buster Posey put together a talented group of hitters. The Giants have had injury problems, with Brandon Belt, who got off to a fascinating start, and who has also returned as of July 2, and Marco Scutaro. If the Giants stay healthy, they will hang with the Dodgers, in what will become a great race. The other three teams in the NL West, the Rockies, Diamondbacks, and Padres have fluked, stumbled, and hit rock bottom in some cases. The Rockies, who were playing incredible baseball in May and early June, have slowed down, falling 13 games back from first. The Padres and Diamondbacks, the worst of the worst in the division, are fumbling towards the end of the season. The Diamondbacks were projected to contend for the division. They lost Patrick Corbin, their ace, to Tommy John Surgery. David Hernandez also had the surgery. They traded Ian Kennedy to Padres at last year’s trade deadline. On offense, Paul Goldschmidt has had a very good year, although he is batting .298. Mark Trumbo, the offseason addition, was bombing home runs before suffering a stress fracture in his foot. The Diamondbacks just can’t put it together. However, the Diamondbacks made a surprise move in May, by hiring Tony LaRussa as chief of baseball operations. I was a little perplexed by the move, wondering what changes he is going to imply to the team. Overall, the Diamondbacks are ailing because of their inability to win close games, and the injuries to their pitching staff. The Padres (oh, the Padres) are just to painful to talk about. The terrible offense, the switching of GM’s, it’s just unbearable. Once we hit the All-Star break, we should have a good guess which team will be pulling ahead. If the Giants continue to slump, the Dodgers will take advantage. Also, don’t expect any selling from either team at trade deadline. Both teams would look to buy. Whatever team finishes 2nd, will surely receive a Wild Card. The NL West may not be as good as projected, but be prepared for a September division battle. When the Nets started the 2013-2014 season at 10-21, talk surrounded around Jason Kidd, who they hired at the beginning of the season. The team, who made a blockbuster trade with the Celtics in the offseason, had high expectations entering the season. Championship expectations. Many people questioned the move. A guy who had no coaching experience and who had just retired from a wonderful NBA career, coaching a old, tired, basketball team. The rumors started about Jason Kidd losing his job. The Nets are a debacle. On and on and on they went. Once 2014 began, the Nets turned the corner, they started playing at a higher level, they started winning games. The East became worse and worse, with Indiana collapsing, and Atlanta losing Al Horford. The Nets sprung up, and got the 6th seed in the Playoffs. They played the inspiring Raptors, with the crazy Canadian fans and the cursing GM. They won the series in 7, and then lost to the Heat in the next round, concluding a overall disappointing season. On June 26, a user on RealGM commented a on a topic having to do with the Nets front office and Kidd. This comment was posted two days before reports surfaced of Kidd asking for the GM spot. His request was denied. It should have been. Kidd thought he deserved more, I guess, after taking a laughingstock to a 2nd round playoff team. It’s ridiculous. Kidd thought he was all that. He thought he deserved more. Kidd was traded to the Bucks for a pair of 2nd round picks. One of Brooklyn’s which Milwaukee owned in 2015, and one in 2019. He signed a new a contract with the Bucks. A 3 year/$7.5 million deal. This will be long enough to make sure the Bucks want to keep for the long run. Kidd walks into a interesting situation with the Bucks. They drafted Jabari Parker and they have Larry Sanders, who loves marijuana more than basketball. The Bucks have the Greek Freak in Giannis Antetokounmpo, who is beyond words (Literally, I still can’t say his name). It’s confusing. I don’t understand why he would want to go there. Good luck attracting free agents. Yes, your a starry name, but still. The Nets are a better option. It came down to a matter of Kidd wanting to have control of a team. Total control. Kidd won’t have that with the Bucks, yet. Eventually, he will. He will over rule in Milwaukee. Nobody will try to stop him. The Bucks have a new era in front of them. They have good young talent, but still need help. Expect nothing from them this season, but, the media will be all over them. On the other end, the Nets have a constantly injured Deron Williams, a old, beat down Kevin Garnett, and a hungry for one more title Paul Pierce, who has a option this summer. They already hired a new coach with Lionel Hollins. Hollins agreed to terms on July 2. He had a very successful last season with the Grizzlies in 2012-2013, but didn’t meet expectations of the front office. Reports also suggest that the Clippers are serious favorites for Pierce. The fit is perfect, and will (if happening) provide skills similar to Danny Granger last year. On top of this bizarre story, the NBA released a document that showed the revenue of the basketball operations for every team. The Nets, atop the list, lost $144 million. They paid $90 million in luxury tax, for a old, injured team, that came far below expectations. The Wizards, 2nd on the list, lost $13 million. The Nets lost more than all of the nine teams who lost money combined. It’s incredible and truly embarrassing. I’m not expecting anything better from the Nets this year. They could be terrible. The Shaun Livingston loss isn’t huge, but he did provide scoring for them this past season. Congrats to him though, especially after his gruesome injury a couple years ago. He will make a great impact with the Warriors. They love those type of players. Back to Nets, they do have Joe Johnson, the clutch, 3-ball drainer who is getting paid $21 million a year, but possesses great shooting skills. KG can’t play more than 25 minutes a game anymore, which is a problem, but will still get 6-8 rebounds and 8-12 points. The Nets do have Mason Plumlee, the upcoming big man whose brother plays on the Suns. They will have Brook Lopez back, who missed most of last season because of a foot injury. Overall, this is maybe a 45 win team next year. They won 44 this year. I feel like going under 40 is too harsh, but it’s very possible. Depending on how bad the East is this year, they will probably make the Playoffs. 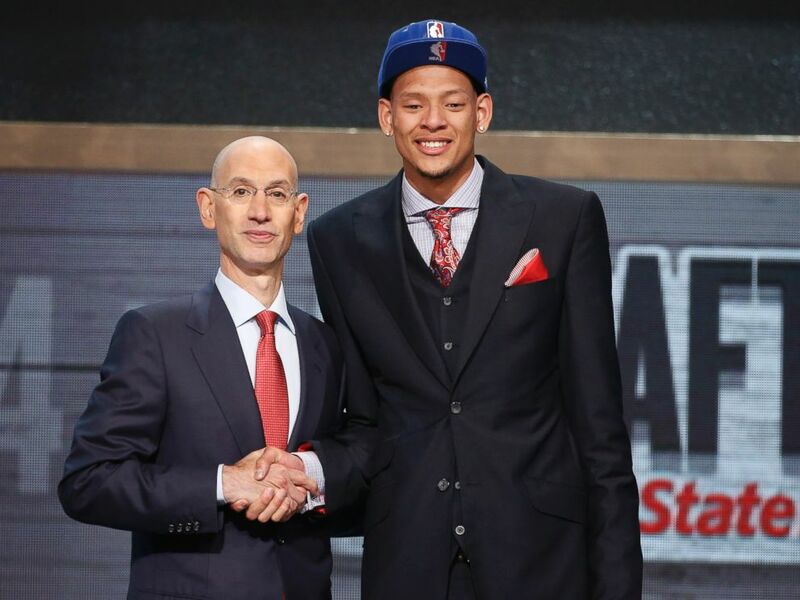 Isaiah Austin, who suffered a career ending injury just days before the Draft, is drafted by the NBA. It came as no surprise when Andrew Wiggins was taken No.1 overall by the Cleveland Cavaliers. When Jabari Parker’s name was called next, it was also no surprise. The two most highly recruited and scouted prospects since Lebron James had gone 1 and 2 in the draft. The next pick, Joel Embiid, the projected No.1 overall pick until he broke a bone in his foot, was taken by the 76ers. It may, in 10 years, be the best pick of this draft. Embiid has two scenarios. 1) He becomes Greg Oden 2.0. He is picked, and expected to be the next superstar, and then suffers through many injuries that eventually end his career. 2) Embiid becomes one of the best big men of all time, putting him in the range of Hakeem Olajuwon and Kareem Abdul-Jabbar. He pushes the record books for rebounding and even points. Back and feet injuries are the last things you a big man to have problems with. If he stays healthy, Embiid will be great. Moving down the line, Marcus Smart, the tempered and talented Point Guard was taken by the Boston Celtics. This leads me to believe that Rajon Rondo may be out in Boston. Watch out for Sacramento to offer for him. Julius Randle, another one of the highly recruited players, was taken after Smart. Randle will play for the Los Angeles Lakers. The Lakers need all the help they can get. He can rebound and get to the rim. One of the best college basketball players ever, Doug McDermott , was taken by the Denver Nuggets, and then traded him to Chicago. The Bulls need all the offense they can get after failing to score in the Playoffs. Hopefully a big time free agent will help too. At No.17, James Young, a very underrated player in this draft, was taken by the Celtics. I love what the Celtics did in this draft. At No.24, the Charlotte Hornets picked Shabazz Napier, one of the best players of the year, and leading his team to a national championship. They later traded him to the Miami Heat, to fit the wants of free agent Lebron James. The Heat gave up astonishing amount to get Napier. Hornets receive: PJ Hairston, Semaj Christon, a 2019 2nd round pick, and cash. With the last pick of the 1st round, the Spurs took Kyle Anderson. A name that was rumored to be a mid-first round pick, slipped to Spurs, where, well, he’s probably gonna figure it out. Worst Draft- Grizzlies, Kings, any team that didn’t have a pick. This really was the wrong draft not to have a pick. SIDE NOTE- Almost every pick in this years 1st round would have gone top 10 in last years. This shows how great this draft was, and how bad last year’s was. SIDE NOTE- Congrats to Isaiah Austin. The NBA selected him right after the 14th pick. Isaiah suffered a career ending injury just days before the draft. Isaiah was diagnosed with Marfan Syndrome, which ended his pursuit of a NBA career. In my opinion, Isaiah was going to go mid-first round. He was also trying to become the first partially blind NBA player. There’s no way to tell yet where this draft will rank all-time. It will probably be top 5. I won’t be surprised if it becomes 3rd best behind 2003 and 1984. Now let the Free Agent Frenzy begin! My name is Hunter Hippel. I am 13 years old and a passionate sports fan. I’ve been told I know to much. My friends say I’m a encyclopedia. That’s why I’m here. Writing about sports. The inspiration? I like to express my feelings. I like all sports. I feel like it’s my job to like all sports. If you like one, you like it all. Your a sports fan or your not. Recognize that? Yea, I know. The Sports Guy, Bill Simmons says that. It’s true. Sports all tie together. It doesn’t matter what kind of job you have in the world of sports. Me? What do I want to do? Write, host a podcast, do radio, maybe TV. I thought I’d better start early. Let’s lay some ground rules. -You might have seen my GOAT (greatest of all-time) page. If I change that, their will be a explanation. If LeBron made the top 5, I would write about. He’s not their yet. Especially after what happened in June. -I like to use analogies. They provide more explanation. Who knows what I’ll refer to. -I can be a homer. I love all my teams, and defend them profusely, because some of them aren’t very good. -No, I’m not gonna stop writing over the summer because baseball is on. Baseball was the first sport people wrote about. -Sorry, I won’t write about golf or tennis. I pay attention to them, but I don’t watch them. I’m not very knowledgeable on both games. This is kinda a experiment. Allow me to adjust and correct any errors I make.